Johnston man collects vintage Drake Relays items. 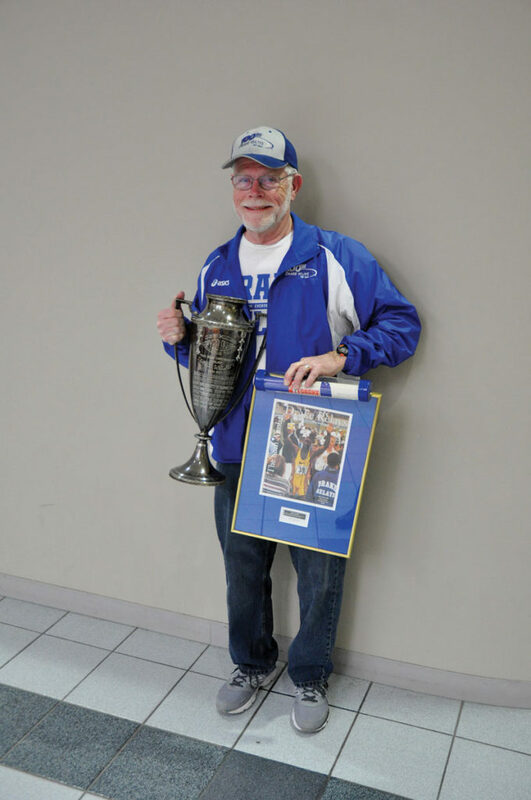 Rich Hoidahl is an avid collector of Drake Relays memorabilia. His collection includes a relay baton that is autographed by Jesse Owens. Des Moines to witness the spectacle of speed. “I was immediately hooked,” remembers Hoidahl. The following year, Hoidahl returned and witnessed Jesse Owens’ induction into the Drake Relays Hall of Fame. Owens had competed in the 1935 Relays as a sophomore at Ohio State and went on to win four gold medals at the 1936 Berlin Olympics. This year marks the 110th Drake Relays. The 2019 event is scheduled for April 24-27. During the previous 61 years, Hoidahl has attended each meet, missing only one day of the action — his son’s baptism was inexplicably scheduled during a Relays weekend in the 1960s. During those past six decades, Hoidahl has had the opportunity to chit-chat with Michael Johnson, prior to the sprinting legend winning multiple Olympic gold medals and achieving superstardom. He also watched as Carl Lewis famously helped to shovel snow from the blue oval. He enjoyed seeing 4-minute milers Jim Ryan, Steve Scott and Alan Webb compete. He also watched a local star, Lolo Jones, emerge as bona fide international talent, and he has witnessed multiple world records being broken. He has done all of this with a smile while experiencing sunburn, rainstorms, sleet and innumerable sunny blue skies. On top of the aforementioned, Hoidahl has amassed what is widely regarded as the largest collection of Drake Relays memorabilia in existence. His one-of-a-kind collection includes award medals, a relay baton autographed by Jesse Owens, track spikes from 1917, a Champions Flag signed by Alan Webb, a 1967 Drake Relays wristwatch signed by Jim Ryan, the top of a hurdle signed by Lolo Jones, and too many other remarkable items to list. But the collection is incomplete. Of the 109 Drake Relays so far, Hoidahl has 103 of the accompanying programs that were distributed. He doesn’t have programs for the years of 1910, 1911, 1914, 1918, 1920 and 1921. To his knowledge, no such program was printed in 1910, thus he needs only five others to complete the set. If you have one of these programs, and if you are willing to part with it, you can reach Hoidahl via email at skoder@earthlink.net. What is the collection for? For the past 35 to 40 years, Hoidahl displays select portions of his collection in the Knapp Center on Thursday and Friday of Drake Relays Week. This year he is adding a day and will be there April 25-27. Hosting hundreds of Olympic gold medalists in its history, the Relays emerged from humble beginnings. The first meet was a one-day event attended by a relatively sparse crowd watching athletes compete during a blizzard. The modern-day Drake Relays attracts 40,000 fans, and it is said to be one of the premier events in track and field.